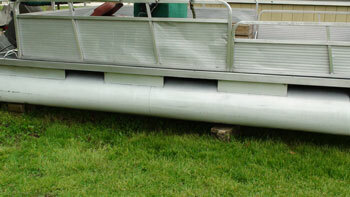 Spray Bio-Kleen Fiberglass Cleaner on the pontoon surface or aluminum boat hull starting from the bottom and working up. Agitate with the brush ensuring even coverage. Agitate entire area with brush again. Aluminum Boat Cleaning and Cleaning Pontoons Directions: Now that the build up has been removed from the aluminum boat or pontoons, the aluminum cleaner can reach the actual surface to clean, de-oxidize and remove stains and discoloration. 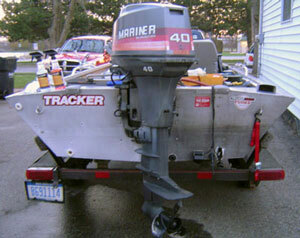 As aluminum boat cleaner begins to run, re-treat exposed areas and brush again. Allow additional dwell time. Always use polishing ball with drill in forward, or clockwise, direction. Place four dime-size drops of metal polish proportionally across the ball for initial application. Add one to two additional drops as needed for the application. Start by using the drill at slow speeds until metal polish is absorbed, then increase speed. Continue down the surface in horizontal motions. Buff off with an additional polishing ball and/or a clean, dry cloth. Always use precaution when using hand tools. Always wear protective eyewear. 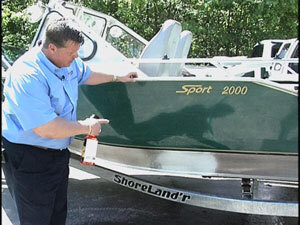 Cleaning pontoons and cleaning aluminum boats can be easy with these three simple steps. 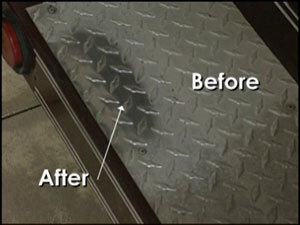 Depending on your desired aluminum cleaning results you may only need to complete one or two of these steps. 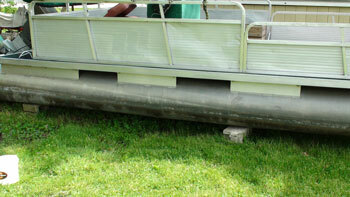 NOTE: For easy cleaning on your pontoon, boat or RV. Try a black streak remover.